We take care of all your structural and foundation needs – from structural pile design and testing, ground improvement and soil stabilisation, to both high-rise and low-rise foundation construction. utilizing vibratory and oscillated casing methods of construction on land-shore and offshore, permanent and temporary liners. Concrete pile trimming using a proprietary hydraulic concrete cutter suspended from excavator or crane for piles of up to 1500mm in diameter. Excavation works for basement construction or pile caps/ground beams. 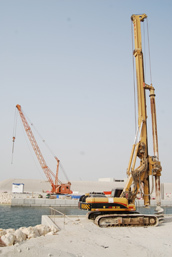 Pile cap and ground beam construction or substructure concrete works associated with basement construction. Reinforcement bar bending and cutting, spirals for pile cages.